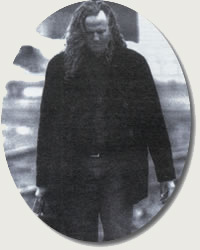 Noted for his two handed tapping technique and a rhythmic approach to the acoustic guitar that doesn't obscure the other essential elements of music making, Preston Reed has been a major creative force in the acoustic guitar world for better than twenty years. Since his first album in 1979, he has issued more than a dozen recordings and several videos. While virtually any special effect or track can be added in the studio, in a Preston Reed concert, listeners often find it hard to believe that they are hearing a single player in real time. For Preston, it's all in a tune's work to create the illusion of a drummer, bass player, and keyboard player, not to mention more than one guitarist. Preston's early influences included John Fahey, Leo Kottke, and jazz pianist Bill Evans, but these musicians were not so much copied as emulated before moving on to uncharted territory. Preston studied classical guitar for a time but there is virtually no precedent for his first paid job as an accompanist to Allen Ginsberg at the Smithsonian Institute at age seventeen. With this auspicious beginning, Preston worked hard to get beyond the traditional confines of the acoustic guitar and succeeded in coming up with a highly original self evolved style. Al DiMeola and the late Michael Hedges have described Preston as "phenomenal" and "inspiring." Preston's composition efforts extend beyond the solo guitar. He has contributed to film soundtracks and his Groovophrenia, a four movement suite for classical guitar quartet, was debuted by the Minneapolis Guitar Quartet in September of 1999. He also presents workshops in which he shares his technical innovations and discoveries. On this truly one of a kind instructional DVD, Preston Reed introduces a wide variety of sounds that you can coax out of your guitar! He teaches "rim shots" and "bongo hits" slap harmonics, double hammer-ons, two handed tapping, right hand fretting and other fingerstyle techniques that will give your playing originality, movement, and lots of excitement! Preston plays and analyzes 3 of his show-stopping instrumental compositions: "Slap Funk, Border Towns, and Tribes" - explaining in great detail the techniques and tunings he uses to get his distinctive, exciting sound! See and hear Preston Reed �live� in concert as he creates the amazing sounds � rim shots, bongo hits, slap harmonics, double hammer-ons, two-handed tapping, right-hand fretting etc. � that have given his playing such notoriety around the world! Songs include: "Blasting Cap, Lady's Night, Slap Funk, Hijacker, Acufuse, Somehow We'll Make It Home, The Rain Maker, Corazon, Hyperjig, Flatonia, Metal". Laurence Juber joins him in two spectacular duets: "Commotion" and "Bad Attitude".